Ever since we moved to Singapore, we've been fortunate to have old and new friends who have tirelessly exerted so much effort to ensure that we feel right at home. From taking us to the must-eat places around the island to inviting us to house parties and all sorts of events, Paul and I have easily adapted to our new life here and we got all of them to thank for. In addition to that, I'm also lucky to have met the nice ladies of Shangri-la Singapore. 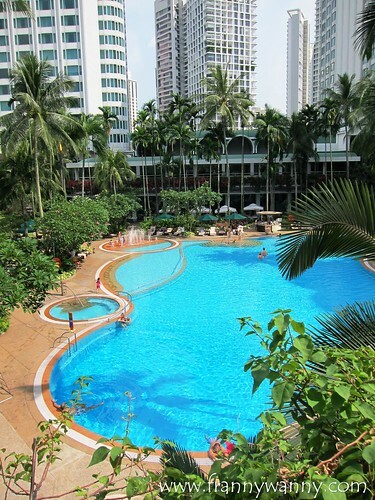 After a short email introduction, Paul and I were invited to go for a weekend staycation at the Garden Wing of the hotel and this was definitely one that we were really looking forward to as relocating to a new country is definitely not an easy walk in the park. Thus, a staycation was definitely a good way for us to unwind and to enjoy each other's company. The following year, our friends from Shangri-la Singapore, once again surprised us with an amazing 3 days, 2 nights stay at the Valley Wing for our 4th Wedding Anniversary. Oh gosh, it was so posh and we loved every minute spent in the hotel that we didn't even bother to go out. Not even for dinner! To this day, I would still daydream about that fun memorable weekend. As you can see, Shangri-la Singapore holds a special place in our hearts as it has been one of those places where we were able to relax and unwind once in a while. Not to mention that they have one of the best hotel buffets in the country plus they got our favourite Shang Palace and how can we forget that romantic Italian dinner date we once had at The Waterfall too? Clearly, we've been frequent visitors and big fans of Shangri-la Singapore that our next goal is to try Nadaman, their in-house Japanese restaurant. 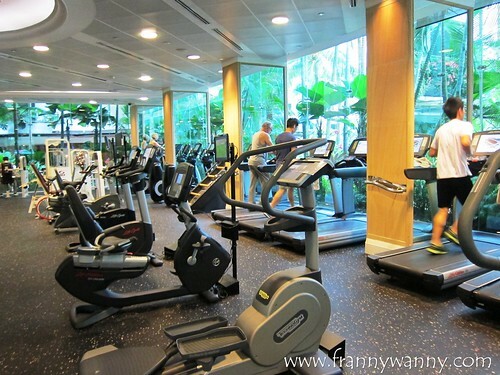 A few weeks ago, Paul and I had another weekend staycation at Shangri-la Singapore where we stayed at the Garden Wing once again as it recently underwent a renovation. After all, it has been two years since our last visit there so a return visit just made perfect sense. We were fortunate to get a room that overlooks the pool as we both love checking out the view from the window as soon as we wake up in the morning. 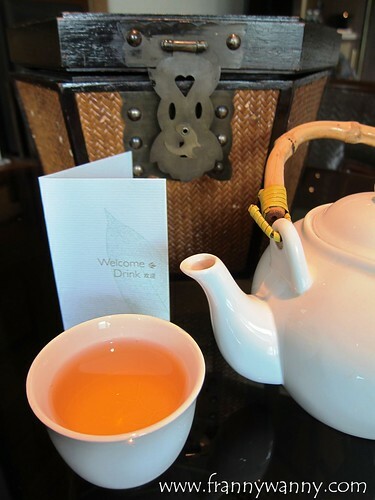 What I love about Shangri-la Singapore is its service. While checking in at the Garden Wing, you'll be offered some cold towels to freshen yourself up as well as some welcome drinks. It just feels like being at a resort, don't you think? 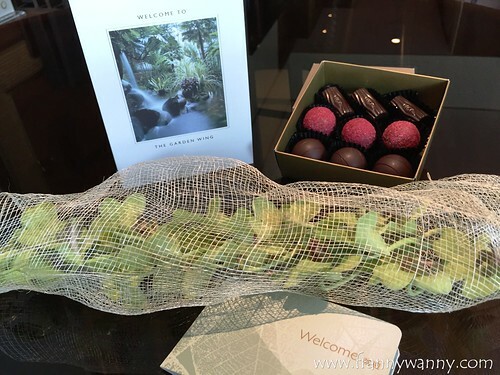 As you get to your room, you'll be greeted with these welcome presents which are really simple tokens but definitely a good way to make you feel welcomed. I really love these pretty flowers and of course, Paul went for the box of chocolates right away. 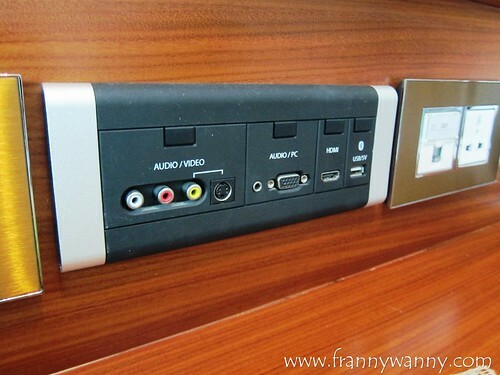 They will give you a few minutes to settle into your room, take a million photos of every single corner, say a hundred more ooh and aahs and then a knock will come where one of their friendly staff will arrive carrying your welcome tea. Encased in a beautiful Oriental box, you can enjoy your tea all day long by simply refilling it with hot water when it runs out. I enjoyed mine while watching TV that afternoon. 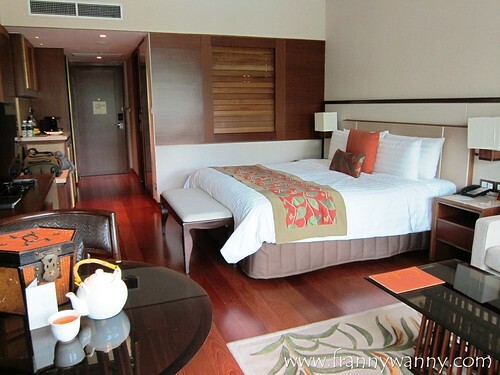 Now, let me take you on a tour around our Deluxe Pool View room. First you'll notice that there's really an abundance of sitting area. From the office table to the comfy couch to the sofa in front of the bed and of course our lovely king-sized bed. It's really the perfect room to laze around whether you just want to watch TV all day, catch up with your favorite series, read a book or to sleep. Since I was nursing a bad bad bad cold that weekend, I think I made the most of the bed while catching up on sleep. One thing that I love about staying in Shangri-la is how they ensure that your room is complete with all the things that you need. The housekeeper, for instance, found out that I was sick and she would constantly check if I need more bottled water. That's really sweet! She also promptly sent over some honey and lemon for me to drink too. 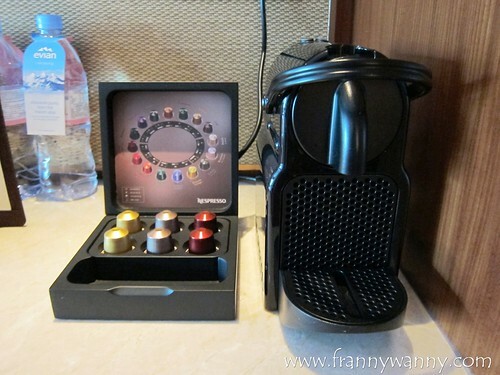 Our room also had a Nespresso machine which we used the following morning. It was so easy to use and we had fun trying out the three different coffee flavor. 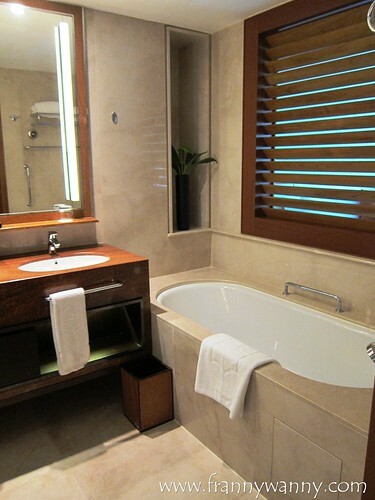 Our bathroom also comes complete with all types of toiletries. I love Shangri-la's signature shampoo and conditioner as it smells soooo good! This is the only time that I would really leave my own toiletries at home as I enjoy using the one provided by the hotel. We enjoyed every minute of our staycation as you can see. After all, there's really no need to head out as you can keep yourself busy within the comfy walls of your room or by checking out the different amenities of the hotel. Paul, for instance, went for a swim at the beautiful pool. I headed to bed early that evening and consoled myself with the thought that I'm waking up tomorrow to enjoy a yummy breakfast at The Line. Tadaahhh! 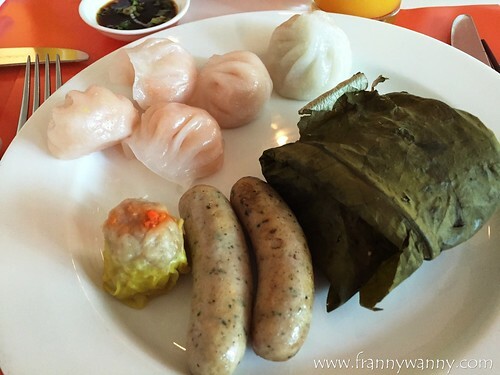 Check out my dimsum platter. I was craving for these for weeks and these yummy steamed masterpieces of The Line have indeed satisfied my nagging dimsum craving. Of course, I had more dishes too such as a bowl of congee, some yogurt, lots of cheese and sausages and omelet cooked right on the spot. Breakfast at The Line is simply the best. After breakfast, we happily headed back to our room to rest. Once again, I took a nap and woke up feeling much more energized and well-rested. This was indeed a good staycation and we can't wait to be back. 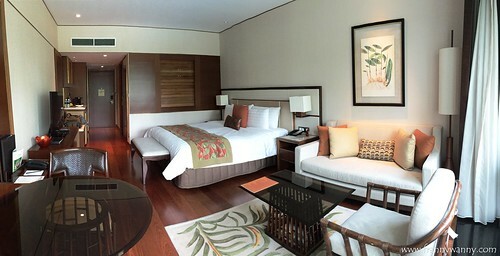 Shangri-la Singapore is located at 22 Orange Grove Road, Singapore 258350. Call them at 6737-3644. Book your room through this link.